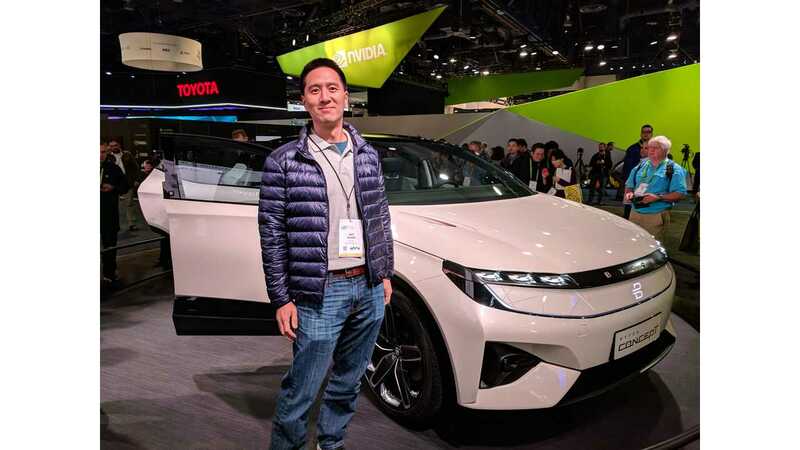 Earlier this month at CES, I sat down with Jeff Chung, Vice President of Engineering and Intelligent Car Experience for BYTON. We discussed the new automaker’s concept car that created quite a stir at this year’s show. I also had the opportunity to go for a couple test rides on a closed course, which was set up in a parking lot outside of the Convention Center. 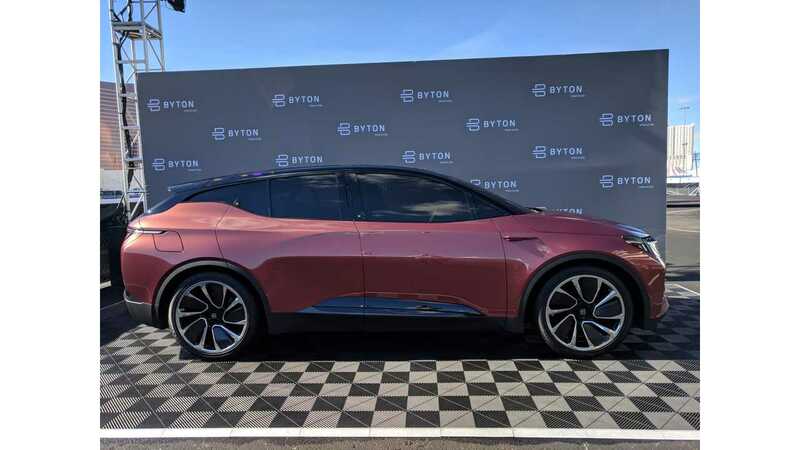 BYTON may have been relatively unknown before CES, but they are definitely on the EV radar-screen now. Before joining the team at BYTON, Jeff worked at Apple where he led system engineering teams in designing multiple Mac products. He’s new to the automotive world, but he seems to really be enjoying his new role in the Chinese-based startup. He’s surrounded by a long list of experienced executives and engineers from existing OEMs, many of whom defected to BYTON from BMW. I started off asking him to tell me a little about how the gesture technology will help drivers take advantage of the huge 49” display screen, without being too distracted while driving. At the BYTON press conference, they promised a car that will have the ability to be upgraded, both software- and hardware-wise. So I asked Jeff to expand a little on that. Next, I asked if it will be a car that’s fun to drive, or if it’s really just designed for autonomous driving. One of the biggest topics I heard being discussed among journalists and bystanders, was how the huge 49” x 10” display might be too much of a distraction and was it just too much information, so I wanted to get Jeff’s thoughts on this. I will note that I took two separate test rides in the car, and did a combined seven laps around the course they had set up in the parking lot. I was able to sit in the front passenger seat for about half of those laps and I noticed that the height of the display was lower than it looks in pictures. My field of vision was way above the top of the screen, which didn’t seem any higher than a conventional dashboard. So in that regard, the display wasn’t physically intrusive. Also, one of my rides was at night, and that was by design so I could try to see if the screen glare was an issue, and surprisingly, it wasn’t. As far as a distraction, I’d really need more time with the car to tell if that was the case. I imagine like anything else, you get used to it after a while and it becomes a non-issue. BYTON announced that voice commands will work through integrated Alexa Voice. I wanted to know if Alexa will be the only voice service offered, or if BYTON was considering others. BYTON’s exterior styling seemed relatively conservative in my opinion. It actually looked like it could be a crossover available today. This clearly isn’t a wild concept that doesn’t look anything like the production car. I asked Jeff what they were looking to accomplish, styling-wise. Lastly, I wanted to know if we’ll actually get everything we see on the concept in the production car. 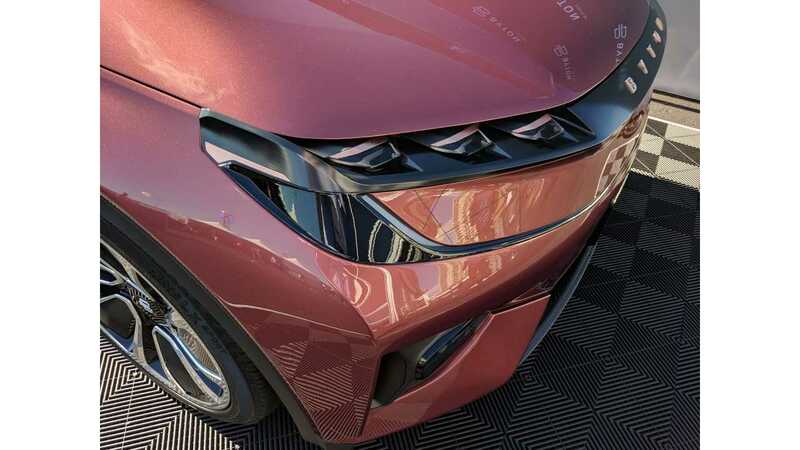 BYTON really seems to be pushing the limits of new tech. 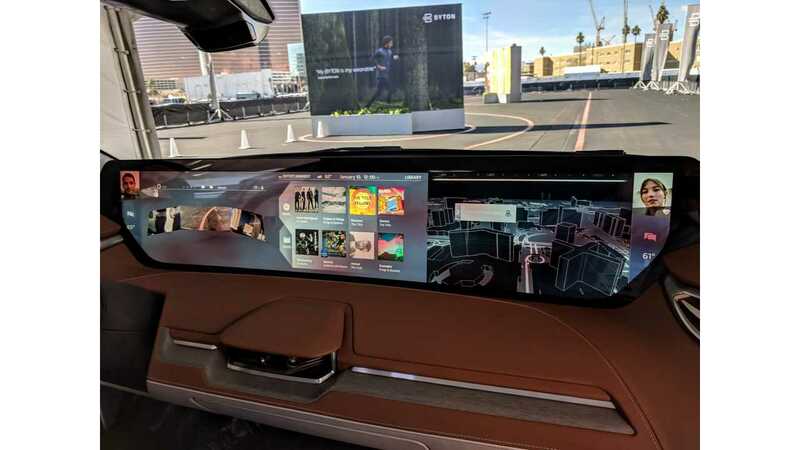 The company has plans for 5G connectivity, a touchscreen tablet in the steering wheel, and Level 3 autonomy at launch with Level 4 hardware already built in (Tesla is currently offering Level 2 autonomous tech). Additionally, there's facial recognition and even a feature called "My Health," where the car knows your weight when you sit in the seat, and also monitors your vital signs via a wearable device. All this seemed like a lot for a car company that was only two years old and promising to launch their first car in about a year and a half. 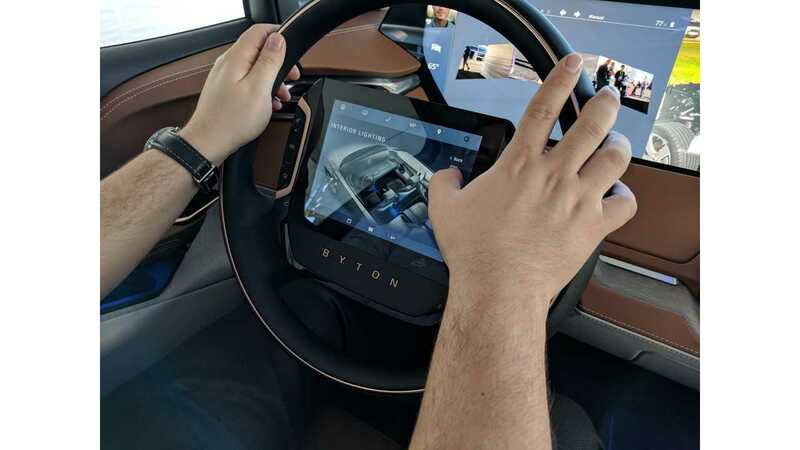 BYTON's steering wheel has an 8" touchscreen tablet in the center. The airbag deploys from the bottom, and I'm told doesn't damage the touchscreen if deployed. Whether or not BYTON makes it to production is still an unknown. What I will say is that I’ve been to a few new car company introductions now and BYTON’s seemed a little different. First off, they arrived with three cars and offered at least three days of continuous test rides. That alone was impressive for a two-year-old startup. 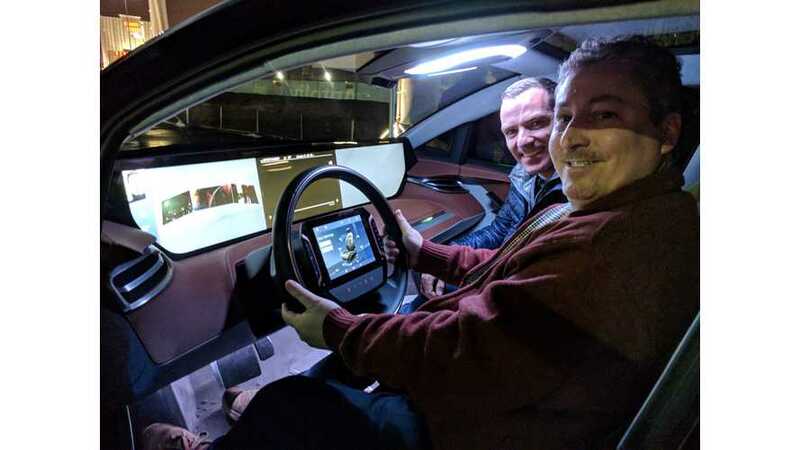 The whole event; the initial press conference, the guided tours that told the BYTON story, the test rides and management’s accessibility for journalist interviews were managed very professionally. BYTON’s introduction didn’t have the same “rookie” feel to me as have some of the other startups, like Faraday Future for instance. Perhaps it’s because BYTON is stocked full of long-time automotive professionals. Carsten Breitfeld is BYTON’s CEO and Co-founder. Breitfeld was previously at BMW for 20 years and was the head of the BMW i8 program. Co-Founder and President Daniel Kirchert was the previous managing director at Infinity China and President of Dongfeng Infinity Motor Co, Ltd. Head of Marketing for BYTON is Henrik Wenders, former Vice President of Product Management for BMW i. Wenders was very accessible at CES and took the time to personally ride along with me for a few laps and answer any questions that I had. I left CES thoroughly impressed with BYTON. I think we’ll be hearing a lot more from this company. While they are still a couple years from actually producing and selling cars, I think this is one company to keep an eye on.